Open since 1929, the On On Hotel is Phuket’s oldest hotel and for the past few decades it was known for having cheap but dismal backpacker rooms. But extensive renovations have changed all that. 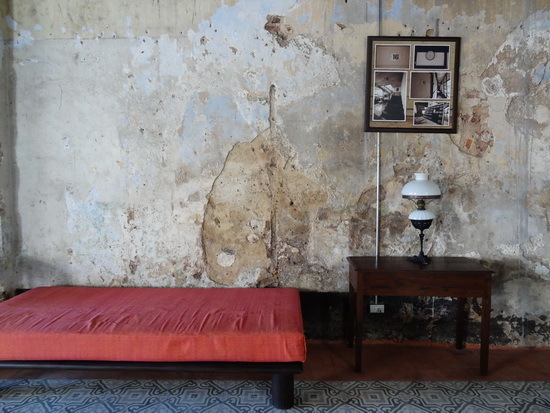 A flophouse no more, the On On has blossomed into a bright, stylish midrange hotel in Phuket Town. Ad Book now! Rates from US$41.42++. Average rating 8.8 from 1,048 reviews. The courtyard helps bring a bit of nature and light in. 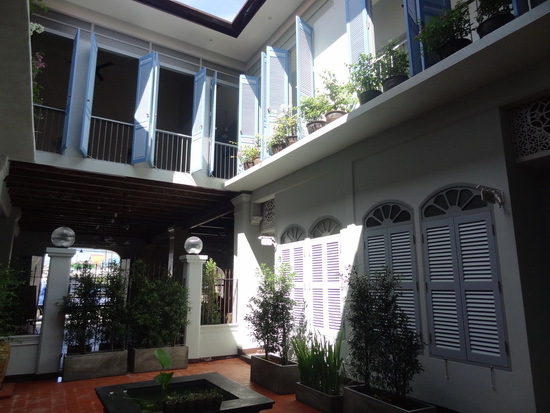 Found in Phuket Town’s Old Town district on Phang Nga Road, the On On’s white Sino-Portuguese-style facade has long made it a landmark location. Before it was shut down for renovations last year, it was one of the few remaining places in Phuket where you could find a room for less than 200 baht per night. The way in to the On On sports a fresh coat of paint. The On On’s infamy only heightened when it appeared in the 2000 Leonardo DiCaprio movie, The Beach, as the dingy, depressing hotel Leo’s character Richard checked into before he delved into Bangkok’s backpacker underbelly on Khao San Road. Times have changed. 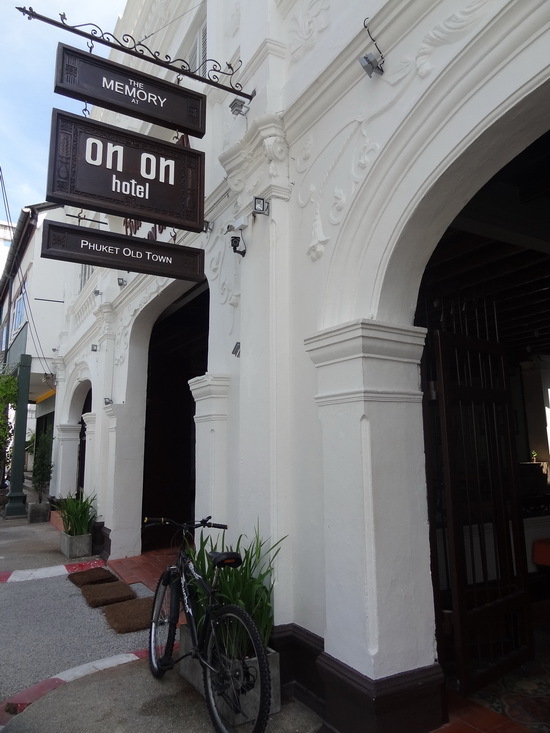 New management at the On On, now somewhat perplexingly renamed The Memory at On On Hotel, has transformed its lobby into a chic and welcoming place, replaced the old bare bulbs with soft lighting and splashed bright colours into every room. And the reception staff here are awake! Helpful and friendly, too. All were keen to show us around and answer questions. The most striking feature at the On On is its central courtyard that opens up to the sky to let in natural light, an original design element that’s been skilfully renewed to become an attractive focal point of the building. The adjacent reception area has retro Sino-Portuguese tiled flooring scattered with some old travel trunks and antiques harking back to the hotel’s 1920s glory days. From just plain shabby to shabby-chic: On On’s lobby area. At the streetside front entrance of the building is another room that’s a lobby and museum of sorts, featuring some old photos of the On On and Old Town hanging on concrete walls. At the other side of the entrance is a restaurant and cafe. The On On’s 44 rooms range from four- or six-bed dormitory rooms with shared bathrooms to superior and deluxe rooms with private bathrooms, to a suite. There’s also a female-only dorm with its own bathroom. Superior room with a private bathroom. All the private rooms have cable TV, a kettle with tea and coffee, a mini-fridge, safety box and a rainfall shower in the bathroom. 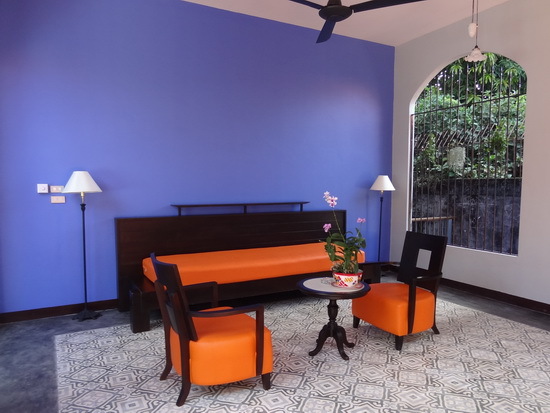 The superior room has three different bed choices: double or twin, currently priced at 1,600 baht, or a triple for 2,100 baht with a double and single bed. In the dorms are desks and lockers, in addition to the bunk beds. 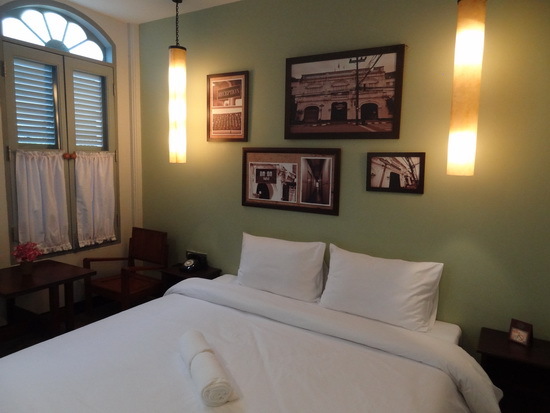 Current ‘soft opening’ rates range from 400 baht a night for dorm rooms to 2,900 baht for the suite. All rooms, including the dorms, are air-con and there’s free WiFi throughout. Rack rates are listed from 500 baht to 5,400 baht. The hotel’s communal spaces are colourful and modern. The ‘blue sala’ lounge on the first floor gives those staying in the private rooms a place to relax in addition to the ground-floor lobby, while the dorms open out to a large common space that has a TV lounge, a dining area with a long bench table (full kitchen facilities are not yet complete) and a washer-dryer set. The On On’s location is ideal for anyone interested in exploring Phuket’s Old Town sights and local food shops, all within easy walking distance from the hotel. Its current pricing puts it out of reach of its tight-budget backpacker traveller guests of yesteryear. But those looking for a midrange hotel in Phuket with some added style and historic flavour would do well to give the new On On a try. Check rates at The Memory at On On Hotel on Booking.com.